Microtoppings or skim coats are type of overlay with a much finer sand mix. Concrete not too bad but you want to give it a face lift? They can be used over existing concrete or overlay surfaces to give them a smooth look and feel. After resurfacing with Overlay the feel and finish isn’t always smooth enough for some people, so by finishing it off with a microtopping or skim coat is a great way to fix that. 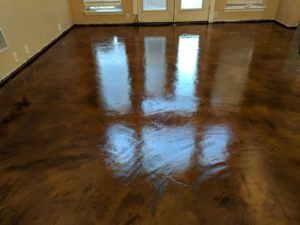 The results are absolutely beautiful when combines with a stain or dye and finished off with a high gloss urethane sealer. Sometimes after removing tile or wood floors you are sometimes left with a very rough concrete surface. Resurfacing the concrete with overlay would be the best thing to do. Applying a skim coat afterwards will be give the best results when applying color and sealer. Use a microtopping or skim coat to turn your family room into a colorful fun area. After using a skim coat, what you are left with is a blank canvas. 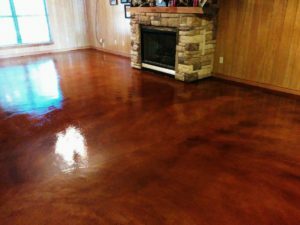 Microtopping and skim coats react very well with acid stains and give you amazing color results.